I'm not sure if I'm behind the times, but Arcadia have recently brought out Style 369. I think it's kind of their fight back to Asos Curve, as a plus size line. Because that's done so well I suppose, the Arcadia group, who brought us DP, Evans and Toppers, have upped their game. 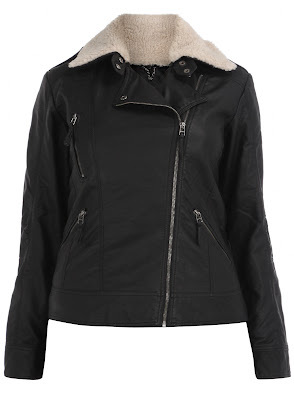 The first pick, is this beautiful aviator jacket. I already have a brown one as you've seen in the last post, and they do have another great tan aviator jacket for £75.00. If you can afford it and don't have a brown one, it's definitely my favourite plus size aviator jacket alternative. s got a rock edge that I think is really on trend. It will go over everything, and I mean everything. It's £59.50. And as if it wasn't perfect enough, I just read that the collar is detachable "for a completely different look". 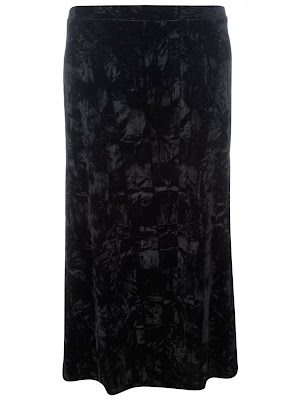 Next is this maxi skirt. And there we all were thinking the maxi dress/skirt was only for summer, here's the winter alternative. The crushed black velvet make it so seasonal, and I think it would look great with the aviator jacket above. Paired with some pixie boots or chunky heels I think it would look great. I'm a big fan of black on black, and not just for slimming reasons, very gothic. For £27.00 I think this would be a great addition for the winter wardrobe. 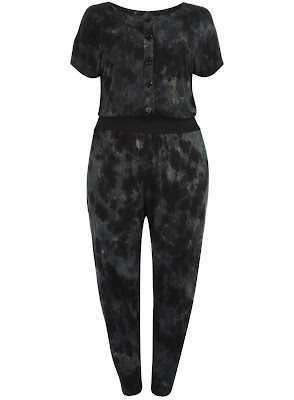 This jumpsuit by Ruby Rocks for £50.00 is pretty pricey but is great for winter nights out. Dressed up with again chunky boots I think it's lovely for a night in the bar with friends. Add a top knot, and its very quirky. The last item I'll be lusting after are these black wedge boots. At £35.00 I think they're a right steal. The boots look like a great height wedge and have that lovely rubber sole detail at the front. I'm a big fan of the lace detail and think they can be dressed up or dressed down depending on the outfit choice. At the moment the website choice isn't that big, but I think it will get better and have a lot more choice. As for my top picks, if anyone else would like to buy me them, I'd be really happy. Have you seen the website, and have you got any faves on there? Thanks btw for following me I really appreciate it, and leaving comments. I'm happy to look and follow anyone else's blog too. Nice pick that aviator jacket. If I win the lottery I'll buy u one thing, LOL! those are some great picks. i haven't checked out their site but have heard about it for a while now! Nice and a great post. I really really like it. Keep it up. Black on black is too much black for me :). I had way too much black in my short lifetime :D because I was a goth in my teen years :]. But the clothes are nice anyway, I will check that site out ;).